In the early 1900s the life of a cowboy was being portrayed in books, magazines, and later in motion pictures. Cowboy life was the envy of many people all around the globe. When the real life of the cowboy came to an end, the era of the guest or dude ranch began. People could satisfy their cowboy fantasies and get a taste of Arizona hospitality at El Rancho Robles. 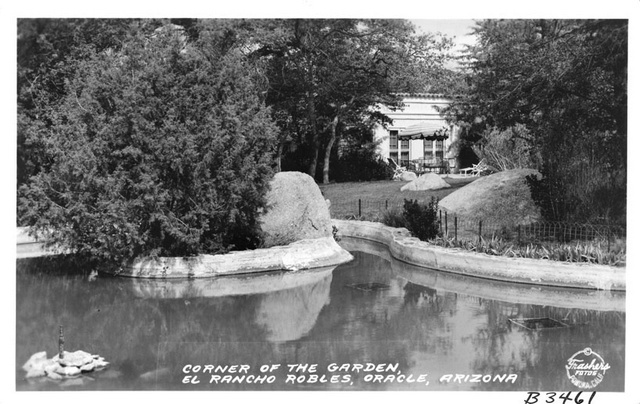 The warm weather and year-round sunshine contributed greatly to El Rancho Robles’ popularity with easterners. In addition, El Rancho Robles emphasized relaxation rather than the vigorous activities advertised by the more remote ranches of Wyoming and Montana. From 1923 to 1927, Charles and Helen Gilliland built and developed a magnificent residence, El Rancho Robles. Within a few years it was to become one of the area’s most popular dude ranches. Horseback riding was the main focus. Often, guests would find themselves on “breakfast rides” traveling along with a chuck-wagon full of flapjacks. Over the years, the property continued to operate as an exclusive guest ranch offering relaxation and the experience of a lifetime. Favorite things to do on the property included campfires, playing horseshoes and lounging in the unusual wading pool captured in a postcard currently displayed at the Pomona Public Library. Later in the century the property was converted to long-term rental homes. El Rancho Robles remained a rental property until 2012, when it was discovered as a diamond in the rough by a New Yorker with experience in restoring historical properties to their former glory. The ranch was purchased by a new owner dedicated to restoring El Rancho Robles and making it a destination for travelers around the globe. Reopened as a guest ranch and retreat center in October 2012, owner Blake Campbell continues to create a magical experience for guests by providing a TRUE guest ranch experience in a picturesque setting as was intended by the founders of El Rancho Robles. Blake has also focused on partnering with non-profits from the area to provide free activities for community children including Santa At The Ranch and community educational services. El Rancho Robles’ spirit of generosity and commitment to the area has been revived!